We looked at four cities that saw steep reductions in homelessness and asked what they did to get there. It’s no secret that homelessness has engulfed the West Coast: Rises in cities like Seattle, LA and San Francisco are the reason homelessness in the U.S. has gone up in the last few years while it continues to go down on the East Coast. Project Homeless has gone to many of those cities looking at what their governments are trying: How San Diego is giving people safe places to live in their cars, how Vancouver, B.C., is betting on small prefabricated homes to end homelessness, and how San Francisco is cracking down on public camping. 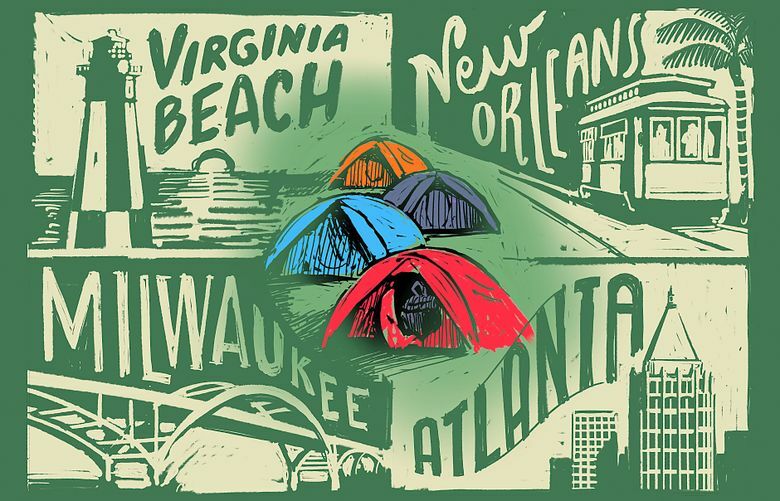 Using federally mandated point-in-time counts, we looked at major U.S. cities where homelessness has gone down the most in the last five years: New Orleans, Atlanta, Milwaukee and Virginia Beach, Virginia. All have seen a 40 percent or more drop in homelessness. There are some caveats. Point-in-time counts, conducted on one night in January, are really just an estimate, and methods of counting vary across the country. Tucson, Arizona, saw a huge decrease over the last five years, but part of that is because they changed the way they count, according to Claudia Powell, board chair of the Tucson Pima Collaboration to End Homelessness. Point-in-time counts may also be measuring cities’ economies as much as their effectiveness at addressing homelessness. Many of these cities are less expensive places to live than Seattle and other West Coast cities. “A lot of these systems in (more expensive cities) are housing people faster and faster … because the number coming in, which the homeless system can’t do anything about, is getting bigger and bigger,” said Nan Roman, CEO of the National Alliance to End Homelessness. Still, point-in-time counts are the most common and standardized measure America has for homelessness. Here is what we learned from cities with the biggest decreases over the past five years. In 2015, first lady Michelle Obama traveled to New Orleans to congratulate the city for being the first in the country to house all of its homeless veterans. “We want cities across this country to follow your lead,” she said. But the Obama administration had poured hundreds of millions into federal housing vouchers for homeless veterans; there was lots of money to house them. After 2015, New Orleans’ leaders decided they were going to focus on a tougher population: chronically homeless people, who have been homeless many times or for years, and often have overlapping mental-health issues and sometimes drug dependencies. New Orleans had dealt with this issue before — after Hurricane Katrina, when thousands of people with disabilities were put out of a home and had to live on the streets, said Casey Guidry, executive director of the Start Corporation, which runs New Orleans’ city-funded shelter. After Hurricane Katrina, the state built more than 3,000 units of permanent supportive-housing projects for poor people with disabilities. Today, it’s one of the few states in the country to use Medicaid to pay for the supportive services in those facilities (which Washington is also working toward). It paid off. From 2013 to 2018, New Orleans had the biggest drop in homelessness in the nation, reducing its homeless population by almost half. And the drop was even steeper with chronically homeless people: the city counted 677 in 2013 and fewer than 200 in 2018. All of that combined with the fact that the New Orleans area has rents about as high, compared to median income, as King County, according to a recent study from Zillow. “I think we had a big problem, and then Hurricane Katrina made it a catastrophic problem, so it forces you to address it … ,” said Guidry. Atlanta has seen some of the most impressive reductions in homelessness in the country (a 44 percent drop since 2013), and not just in the city. Some of the counties in Atlanta metro have seen a bigger decrease. The most impressive part: Atlanta’s chronically homeless population dropped from over 1,400 in 2013 down to just 335 in 2018. Atlanta bounced back really well from the recession, with a job market that’s friendly to entry-level workers and cheaper rents than Seattle. Atlanta’s philanthropic community also has put millions into getting homeless people jobs. One of the country’s largest nonprofit staffing agencies, First Step Staffing, started in Atlanta. In 2018, First Step hired over 3,500 homeless people in Atlanta, and the company says it paid $19 million in wages. Yet even when they can afford rent, homeless people — many of whom have bad credit histories or criminal backgrounds — have trouble finding a place to live, Hardin said. Atlanta’s most innovative program may be Open Doors, an organization employing people with real-estate backgrounds to leverage their relationships in the market and persuade landlords to rent to homeless people. That program opened up thousands of apartments to homeless people, and it’s a program Seattle and King County are already replicating, as The Seattle Times wrote in December. There are two important differences between Wisconsin’s Milwaukee County and King County: First, Milwaukee is one of the cheapest major cities to live in — rent has barely risen since 2015 — in America; and second, the county government — not a federal housing authority, like in King County — controls Section 8 and other federal vouchers. Those and other factors have added up to a 40 percent plunge in homelessness in the past five years, among the highest in the nation. Milwaukee County (population of nearly 1 million people) focused on ending chronic homelessness with a plan that moved people off the streets and immediately into permanent housing, even before entering mental-health and drug treatment. And because the county controls the federal vouchers, it has social workers walking into homeless camps and handing people rent vouchers. Mathy acknowledges Milwaukee had advantages not available in King County, including low rent. But the strategy works, he said. “We really think we’ve found the blueprint not just to ending chronic homelessness but dramatically reducing overall homelessness in our state,” he said. Transitional housing is the middle step between emergency shelter and an apartment, with staff and services, and stays of a few months to a few years. But often, people staying in transitional housing stay there for the allotted time and don’t have a plan to leave, according to Roman, of the National Alliance to End Homelessness. In Virginia Beach, Virginia, the average stay for each of the city’s 107 transitional-housing beds was well over 100 days, according to Pam Shine, coordinator of the city’s housing homeless programs. The limit was two years. The whole time they’re in transitional housing, all of those people count as homeless. So what Virginia Beach did was part accounting and part restructure: It took most of the money from transitional housing and put it toward “rapid rehousing” vouchers so people could go straight from the streets to an apartment. Seattle and King County have done this as well, reducing transitional housing by about a thousand beds since 2015, according to numbers from the U.S. Department of Housing and Urban Development, while also dramatically increasing spending on rental vouchers (although that approach has been criticized by some nonprofits). “We have really taken away the connotation that transitional housing is about sitting for two years and then working on your plan six months before you have to leave,” said Shine. Seattle Times Project Homeless editor Jonathan Martin contributed to this report.